Made in U.S.A. The first models were introduced about 1963/4. Distinctive features: One of the first transistorised, desktop calculators. The first programmable desktop calculator, using a 'Learning' mode. Capabilities - 4 functions, memory, raising to powers. Programmable using a Key-stroke Learn mode. Mathatron 424, which has 4 registers for the storage of numbers and memory capacity of up to 24 steps of algebraic instruction. Mathatron 848, which has 8 registers for the storage of numbers and memory capacity of up to 48 steps of algebraic instruction. Display - Results printed on paper tape. Technology - Employs resistor-transistor logic (RTL). Manufacture - Made by Wright Line, a division of Barry Wright Corporation, of Worcester, Massachusetts, U.S.A. The machine shown here was photographed at the National Museum of Computing, Bletchley Park, UK. Closeup of the Mathatron showing the paper-tape printer, at top, and the keyboard below. Significance: The Mathatron is an electronic calculator which is programmable using a Learning mode. The slightly later Olivetti Programma 101 is often referred to as the first programmable calculator, and is more advanced in that it can store and recall programs using magnetic cards. Optional extension packs were available to increase the functionality: 'Complex Number/Trig Pack', 'Statistics Pack', and 'Surveyor Pack'. 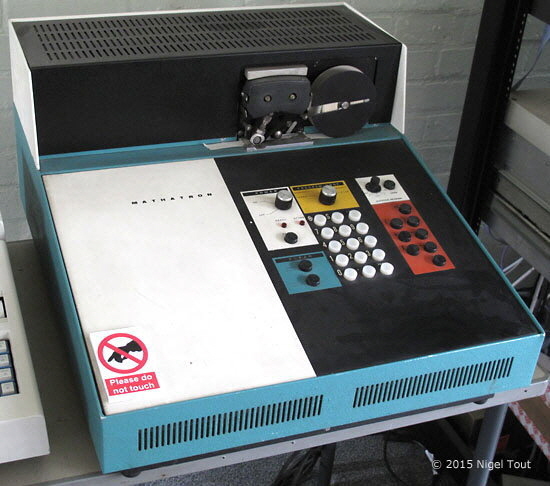 Also available was a 'Program Storage Unit', which when connected to a Mathatron 484 provided 480 steps of memory and 48 storage registers, and a 'Paper Tape Punch/Reader and Page Printer', which stores programs on punched tape and can print the calculations and other information. These are described in the Mathatron brochure from September 1967. 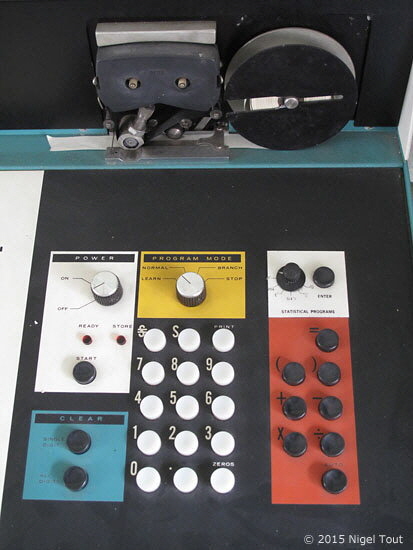 There are excellent technical descriptions of the Mathatron, with photographs, at Alex Knight's 'The Calculator Museum - Desktop Calculator Gallery' and at Rick Bensene's 'Old Calculator Web Museum'. Youtube has a brief video of a Mathatron in operation at https://www.youtube.com/watch?v=Sz218uWmT9k.